With summer just around the corner, now is the perfect time to check your deck for any necessary repairs or rebuilding. Winter weather can take an especially harsh toll on your deck. Between the constant temperature changes and the weight of snow and ice, your deck may be in rough shape by the time warmer weather rolls around. With summer just around the corner, now is the perfect time to check your deck for any necessary repairs or rebuilding. No matter which type of material your deck may be, every material shows damage in a different way. Wood decks often show signs of warping, while vinyl or composite decks typically show cracking or fading if especially damaged. Particularly harsh winter weather can often yield some serious structural damage on your deck, as joists and posts can be affected by changes in temperature and moisture levels. If you notice any uneven posts or structural damage to your deck, it may be time to rebuild it, as reparative efforts may not be enough to shift these parts back to their proper standing. If your deck endured a winter of snow and rain, it is especially crucial to check your deck for any signs of excess moisture or rot. Moisture lingering in the wood of your deck often requires replacement and cannot be repaired, as mold can rapidly spread throughout the structure as the weather gets warmer. Rot can also soften the wood and cause breakage, which can be especially dangerous if you are attempting to use your deck during the summer. 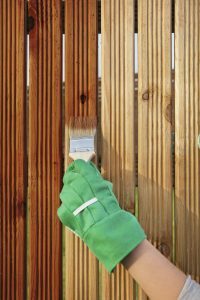 When in doubt, it is always smart to ask the professionals for any advice regarding your deck or fence materials. Let the experts advise you on which parts of your deck can be easily repaired and which may need total replacement in the future. Once your deck is well maintained and prepared for the summer, you can enjoy the warm days in your yard with your new outdoor entertaining space.